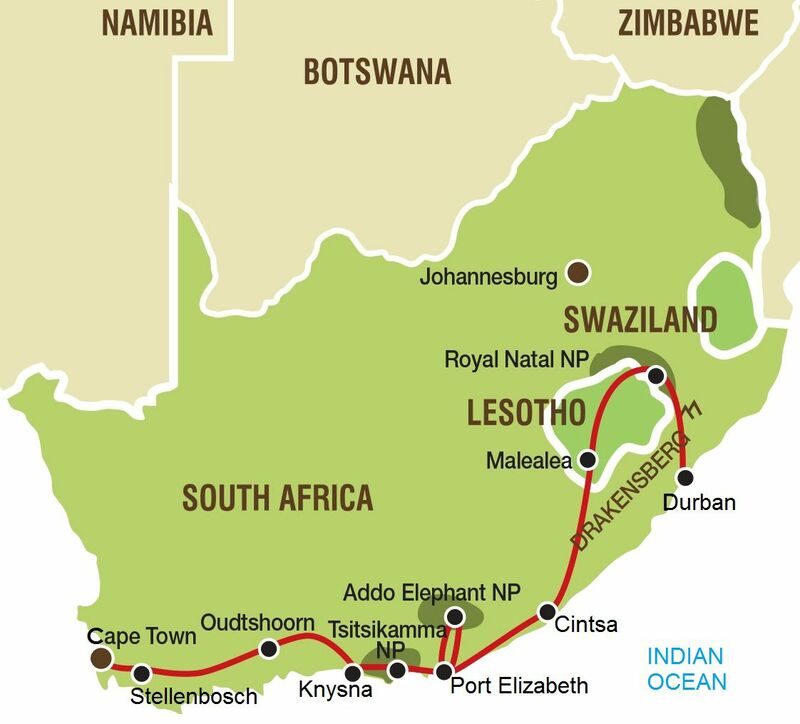 Our Garden Route and Lesotho Tour forms part of the longer 20 day “Explore South Africa” tour North. Your overland group tour starts in Cape Town and ends in Durban (South Africa). Your Garden Route and Lesotho group tour starts today. We have a full day ahead of us which takes us from the bustling city centre of Cape Town via the vineyards to the town of Hermanus. En-route we will stop at the largest breeding colony of the African Penguin at Stony Point Nature Reserve. Made up of a collection of villages, farms, rivers, bays, coves and valleys, the Cape Whale Coast is a pristine stretch of the South African coastline which runs from the town of Rooiels for roughly 150km, to the east.During the months of July to November you may be lucky enough to see the southern right whales that visit the bay in Hermanus. It’s all downhill as we leave the mountain scenery en route to the Kwazulu Natal Coast. On the 5th August 1962, police waved down a car on a lonely country road in KwaZulu-Natal. At the wheel was Nelson Mandela. He was arrested and spent 27 years in prison. Today you will have the opportunity to visit this historic capture site, marked by an impressive sculpture in honour of “Madiba”. We will also stop at the Howick Falls to listen to the power of the falls and take some photos at the view point. Then it’s onto the bustling city of Durban is South Africa’s largest port and well-known surfing destination. Your tour comes to an end on arrival in Durban.